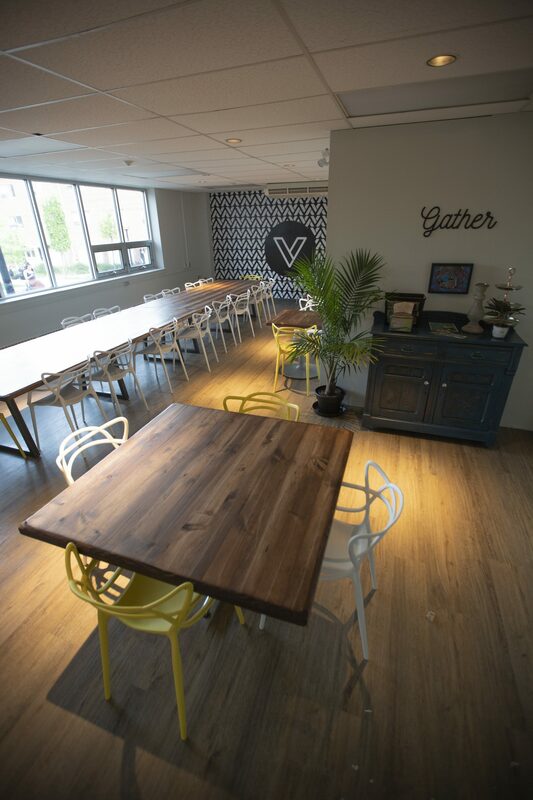 Veritas Café is known around Laurier for many reasons — the main being that it is a great hangout spot for students. Patrick McMahon, the operations manager since January 2017, has a passion for providing quality food to Laurier for many years. McMahon has a history of working for Laurier food services, as he was the restaurant and catering manager of Wilf’s six years ago. McMahon’s mission at Veritas, however, is to provide quality food to students and utilize local, fresh ingredients. In an effort to revitalize and revamp the space, renovations for the space started in June 2018, and the café’s reopening launch was on Sept. 17. “The biggest difference is that we’ve added double the space. Our GSA office moved into the Peters, so we went from having 42 seats to having 80 seats, and it also allows us to have private events booked and so we don’t have to close the café which was pretty common before.” McMahon said. The space also changed to a more modern look, having white tiled walls, wooden tables, and two sliding barn style doors that open up to reveal the extended space, decorated with a chevron-style wall using their new Veritas “V” as the pattern. Other than space for the customers, Veritas has also doubled the space in their kitchen and is working on plans for the future in their newly expanded kitchen. “We’re opening with a pretty similar look in food, but we’re planning on expanding that with take home dinners for busy people, we’re launching an online marketplace for students and faculty to be able to order direct from farmers and pick-up in the café.” McMahon said. Veritas is now officially open for business to all students and is somewhere that can be used as a study space, somewhere to grab a bite to eat, or one can even grab a drink with the wine, beer and spirits they carry in house. Even though Veritas has increased their space both for customers and staff to help speed up service, they will not be compromising what they stand for. “We’re still serving fresh, homemade quality food, our principles haven’t changed with renovations, we’re not just trying to capitalize on the space. We’re still serving fresh, local food, we just want to be serving it faster,” McMahon said. Putting together quality meals that will help students sustain healthier lifestyles on campus are a main priority for the employees at Veritas. “We really pride ourselves on the ingredients, we really spend some time finding the best ingredients to go in. The first thing we look at is where it’s coming from, it does set us apart. I know the dining hall and Wilf’s do that too, but our top priority is finding the ingredients and then we set our prices. We bring in from local bakeries, we are not buying cases of anything from anywhere,” McMahon said. “It’s a really fresh, modern, rustic looking space, it’s comfortable. We’re not going to rush you out of here if you want to come in and have a coffee and spend the afternoon doing homework. We want to welcome everybody here, it’s not just about us selling people food; it’s a place for community.” McMahon said. Author: Hayley McGoldrickHayley is an aspiring sports journalist who started writing for The Cord in the sports section, but is now ready to explore all that the world has to offer as News Editor. She loves college football, spinach dip, and always being right.